Learning how to market your listings on Zillow can take your income to the next level. We’ll show you how to leverage the platform to get more Zillow views, take advantage of Zillow’s sorting, create a well-written description, use photos, and upload video walk-throughs to have your listings stand out from the crowd. The first step in leveraging all Zillow has to offer is to become a Zillow Premier Agent. Being a Zillow Premier Agent opens doors of opportunity and gives you increased Zillow views and advantages that non-Premier Agents just can’t compete with. As well as being able to gain new clients by advertising on local listings provided by non-Premier Agents, you can be the exclusive agent displayed on listings where you’re the seller’s agent, which increases your odds of collecting both sides of the commission. Zillow sorts listings by newness as their default. If you don’t want your listing to continue sinking in the search results as time passes, there are strategies on how to get more Zillow views. While a brand-new listing will always rank higher than an older one, changing the pricing or adding an open house can raise your listing position. While you don’t want to drop the price too regularly or dramatically, you can make small adjustments to keep your listings on the first page to get more Zillow views. For example, if your listing has been on the market for a month, and the owners are averse to a more aggressive price adjustment, you might drop the price by $99 just to get the listing back to a more favorable viewing position. 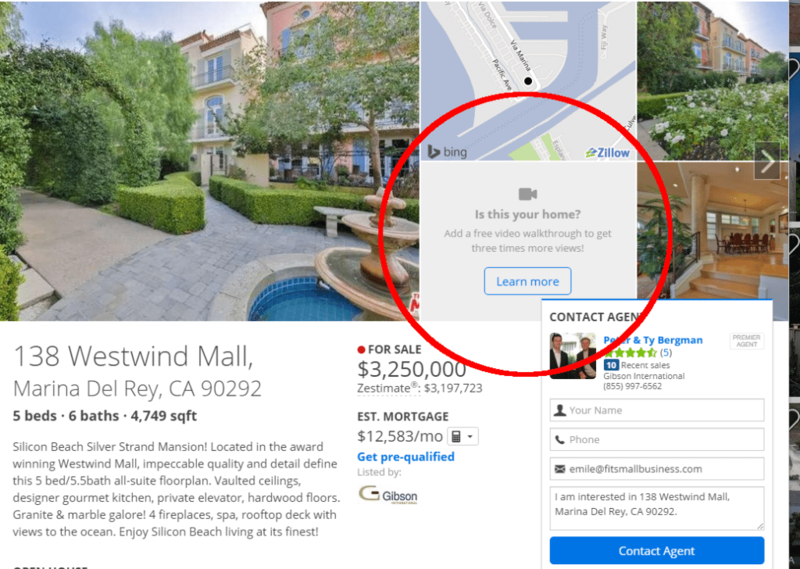 Something to consider when learning how to market your listings on Zillow is not just the platform experience of homebuyers, but how Zillow notifies those outside of that platform. For example, if a homebuyer is signed up for Zillow email alerts and is following that home, they will get a notification email every time you drop the price or add an open house. If you use the Zillow Premier Agent app, you also get notifications when people save the home. Simply click on the listing, and there should be an “Analytics” button. You should be able to see views, saves, comparable homes on the market, and how your listing is comparing with other listings currently offered. Holding regular open houses can also boost your listing for maximal exposure on Zillow. While dropping the price too many times on a home might make people question the value of your listing, holding regular open houses usually does not raise a red flag. For maximal exposure to your audience, always remember to add your open houses to Zillow a few days before they’re scheduled. For example, if you have a regular open house on Sunday, add the open house date to Zillow on Thursday to give people who are browsing time to plan and attend. Adding an open house to a listing will help keep your listing high in the search results, increasing your Zillow views as well as notifying homebuyers who are signed up for email notifications. For ideas on how to create a successful open house, see our article on 35 real estate open house ideas people love. Taking the time to write a solid listing description ultimately converts site visitors to contact you. While everyone looks at the listing photos first, most will also read your home description carefully for details before reaching out. Here are a few tips to make your home description and features section pop. 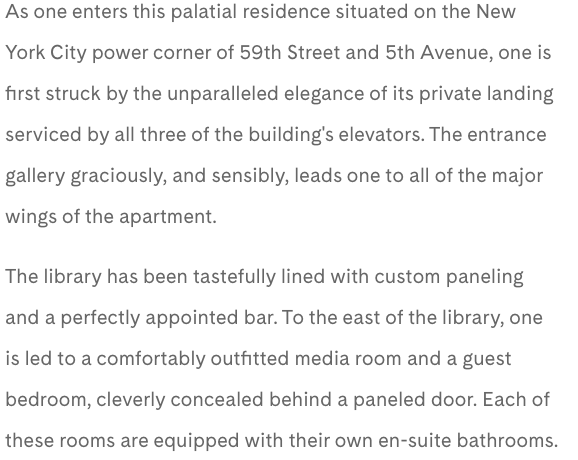 While already a spectacular property, notice how evocative a portion of the listing description is for 781 Fifth Avenue #18th floor. Remember that words matter, so choose them carefully and descriptively. Zillow’s own research team found, for example, that “Of all homes listed for sale on Zillow between 2016 and 2017, those mentioning ‘steam shower’ in their listing descriptions earned their sellers a 29 percent higher sale price than listings that didn’t mention it.” Being descriptive can pay off. Instead of just listing home features in your listing description, Zillow has a dedicated place to enter them into their database. While adding these features exhaustively on Zillow can be a bit of a chore, it’s a task well worth your time. 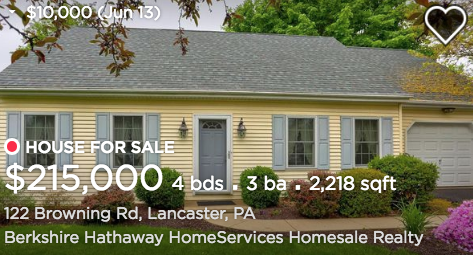 While listing descriptions are generally analyzed by Zillow’s search algorithm, the system seems a bit imperfect and works better with reinforcement. For example, if you have a Tudor-style home you’re trying to sell and don’t add that to the details section (under construction) when adding your listing, Zillow might not pick up the text from your listing description. That means when people search for “Tudor homes” or something similar on Zillow, yours might not show up. Instead, add every single detail possible into the home details section to get more Zillow views. 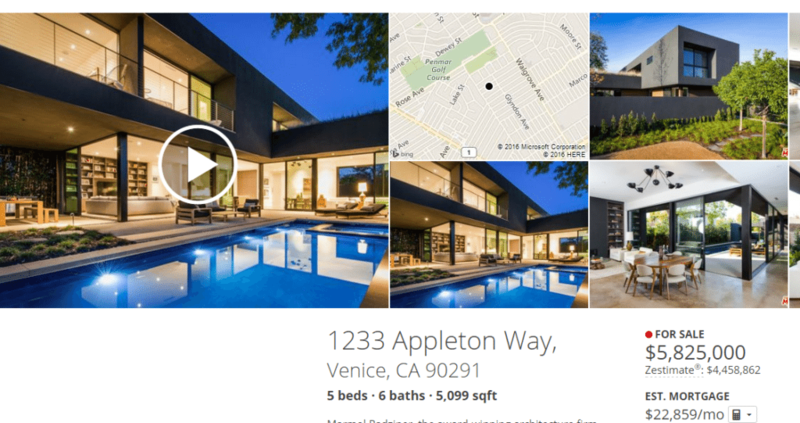 Another great reason to add home details to Zillow as well as your description is that they now list popular home styles for each zip code at the bottom of the search results. 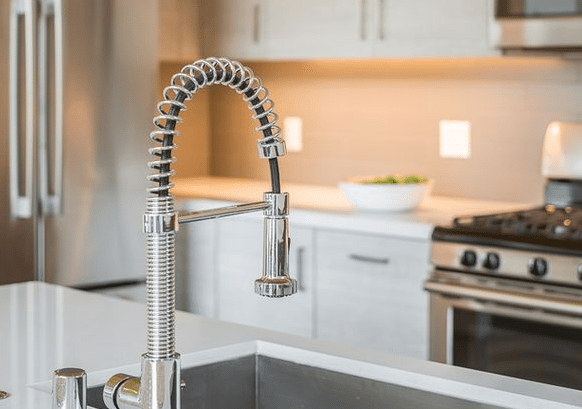 For example, when you search for homes in Portland, Oregon, there are three buttons labeled “Craftsman Style,” “Least Expensive,” and “Lofts.” This data is pulled from the home details section of your listing, NOT your description! Your listing pictures are going to be your best marketing tool on Zillow. If you want to know how to market your listings on Zillow, the best thing you can do is include outstanding photography to have your listings sell faster for more money. And Zillow’s own national research shows that a home with fewer than nine photos is about 20 percent less likely to sell in sixty days than a home with 22 to 27 photos. Here’s how to leverage your listing pictures to maximize calls, emails, and open house attendance. Many agents believe they can take their own photographs to save time and money, and this is a mistake. Of course, hiring a professional real estate photographer will cost you $150 to $350 out of your own pocket, but there are three compelling reasons why this is one of the best investments you can make as you continue your real estate career. Most experienced agents are well aware that professional photography helps homes sell for more money, and research certainly supports them. According to a study done by Redfin, homes listed between $200,000 and $1 million sold for $3,400 to $11,200 more relative to their list prices when listing photos are taken with DSLR cameras. 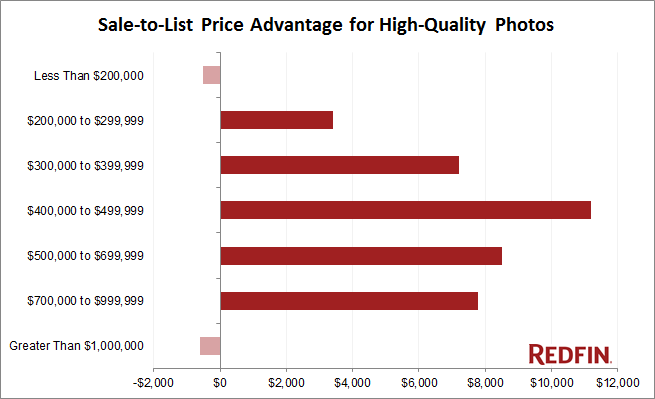 Across all price ranges, homes with professional photos sold faster than their amateur photography peers. 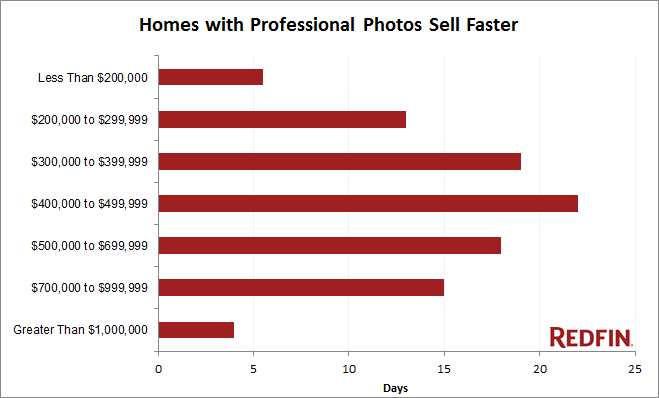 In the million dollar range, professionally photographed homes sold four days faster, and those in the $400,000 range sold three weeks faster than their counterparts with amateur photos. Using professional photography in your listings can not only help you sell homes faster and for more money now, but help get you new clients in the future. Pitches to potential listing clients always include marketing strategies and expertise. Most of the time, you’ll want to showcase your successes and typical listings. Presenting a listing that you shot with your phone is going to make quite a different impression than one shot professionally. Although hiring a professional photographer is the preferred way to go, if you must take your own, there are definitely steps that can make your photos better. Our article on the top 25 real estate photography tips and mistakes to avoid can help improve your listing photos dramatically. When learning how to market your listings on Zillow, be sure to pay attention to the details. Select the right photos to add and be sure to comply with Zillow’s policy about photography. Here are a few tips to make sure your pictures get you as many leads as possible. Far too many agents assume the more photos they include, the more effective it is, but this is not the case. Uploading too many photos, particularly photos of the same room or area, can seem unfocused and like you are distracting from something else. Here are what photos to include. One great shot for each room in the house. A “hero” shot of the exterior and backyard. A drone picture of the entire property if needed. For more on the do’s and don’ts of using drones for real estate photography, check out our guide here. If you have a historic or unique home, detail shots of woodwork, cornices, or other enticing features are a great addition. Just remember to not overdo it. A typical 3,000 square-foot home doesn’t need 50 pictures on Zillow, especially when ten of them are of the living room! Ten to fifteen images are more than enough. Before you start using any photography to market your listings on Zillow, you need to understand their rules for listing photography. Brokerage or team watermarks are not allowed on listing pictures. The only watermark allowed on Zillow is from your MLS. Name and/or phone numbers are not allowed on listing pictures. Descriptive text is not allowed on listing pictures. In 2018, there is no excuse for bad listing photography. Well-done photography will not get you Zillow views if it’s distorted. 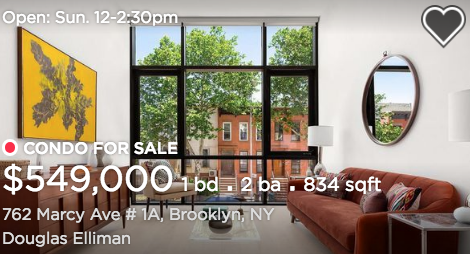 We’ve all seen the tragedy of stunning multi-million dollar listings with beautiful, professionally shot photos that are stretched out, pixelated, or blurry. Be sure you ask your real estate photographer to send you images in 960×629 pixels at 72 dpi or larger. These are the default dimensions that Zillow uses for all listing photos, and they will automatically reduce or enlarge them to fit these dimensions. As you will see from the two listing pictures below, there is a big difference in clarity when using a photo that’s properly sized. The first picture was uploaded at a size smaller than 960×629, while the second picture was uploaded at 960×629 or larger. According to Zillow, video walk-throughs can triple the number of views your listing gets. Not only are people drawn to the image of the play button, but adding video through your Zillow Premier Agent app can also help your listing rank higher. Listings with a video walk-through are sorted to the top of Zillow search results. It’s incredibly easy to post videos on your listings using the Zillow Premier Agent app. While the app is free to any realtor and has a range of benefits we rave about, the ability to post video walk-throughs directly from your mobile phone is a game changer. If you want the easiest way to get your walk-through videos into your listings, download the app and get to work. In our recent article, we show you how to use the Zillow Premier Agent app and all the features it offers. Below are two different listings on Zillow. The first has a video walk-through, while the second doesn’t. These images show how enticing even having a listing video can be, and how something seems missing from the second. Listing with video walk-through. Notice how prominent and clickable that giant play button is. When thinking about listing without a walk-through video, consider which seems more clickable to get more Zillow views, and which appears more professional? If you want to learn other ways to take videos that can be added to your listings, we offer you some great real estate video examples and 15 tips on how to do them yourself. The video you produce will only be as good as the equipment you use. If you are using a video made through the Zillow Premier Agent app, investing in a few pieces of equipment can pay off in spades. Be sure your phone takes solid video and that you use a stabilizer to keep the image smooth and consistent. This is the time to upgrade that old phone. The Google Pixel 2XL, iPhone X, and Samsung Galaxy S9 have some of the best-rated cameras on the market. I personally use a Samsung and have loved their amazing photographic capability. Should you decide to upgrade, they usually have the best prices on Amazon. While image stabilization has gotten better on smartphones, shaky hands or quick movements will still lead to blurring in your videos. The solution is to buy a stabilizer for your phone. 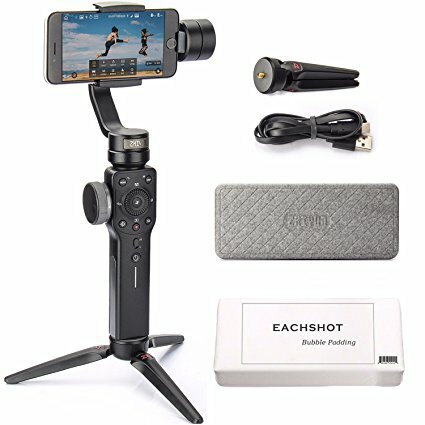 The Zhiyun Smooth 4 3-Axis Handheld Gimbal Stabilizer w/Focus Pull and Zoom is rated well and can turn your smartphone into a near-professional video producing machine. When marking your listings on Zillow using video, you only have two minutes for your complete video, so you have to make every moment count. Plan out what you’re going to shoot and for how long. Typically, a good walk-through will start at the front door, then walk through the main rooms of the house, focusing on covering the living room, kitchen, dining room, master bedroom, and backyard. Always try to time your videos for a sunny day for maximum light. In very large or expansive listings of 5,000 square feet or more, you have to approach it a bit differently. Be sure to hit the same highlights you would with a smaller listing, such as the living room, kitchen, dining room, master bedroom, and backyard, but also include anything unique as well. For example, if the home has a stunning wine cellar, be sure it makes an appearance on video as well as your listing photos. Thankfully, the process is incredibly easy. The Zillow Premier Agent app lets you shoot and save video, move to another room, and continue shooting. The app will stitch together the different videos into one. Instead of wasting video time walking down hallways, shoot one room, save the video, then move on to the next room. For smaller listings under 3,000 square feet, shooting one smooth walk-through might work better. People want what they can’t have, and real estate is no exception to the rule. Every agent secretly wishes they had a few pocket listings, and every consumer wants access to listings before they hit the market. Zillow helps give agents an advantage and allows their Zillow Premier Agents to post “Coming Soon” listings. There are incredible benefits in being a Zillow Premier Agent, but the potential upside in posting “Coming Soon” listings is obvious. You’re far more likely to have dual agency (representing both the buyer and seller and collecting the entire commission), as well as increased Zillow views and leads because of exclusivity. However, there can be some big drawbacks. You may run afoul of NAR regulations or even your state’s real estate laws. If you’re planning on posting a “Coming Soon” listing on Zillow, make sure you fully discuss the pros and cons with your managing broker, legal counsel, or check with your state’s real estate commission. Understanding how to market your listings on Zillow truly takes understanding as to how the platform works and leveraging it to its best use. Get the full benefit of your efforts by being the only agent listed and preventing other agents from stealing your leads. Zillow Premier Agent allows you to be the exclusive agent on your Zillow listings so you can be the ONLY agent prospects see on your listings rather than just one of three. This article has great information on getting more views. I still see real estate agents who don’t want to spend the money to hire a professional when it’s the #1 marketing tool for a listing. However, I would like to see more statistics on video and drone usage. I’m a licensed real estate agent and have a professional real estate photography business as well (visit us at VistaPointDrones.com). We frequently come across agents who are still hesitant on adding much needed drone services. You can’t showcase a vacant lot with a picture of tall grass and trees. Getting these statistics would increase the likely hood of higher quality listings in the future. Appreciate your perspective here, but not every property will benefit from having drone footage or even drone photography. I do agree that professional pictures are a must though. If you click on “listing type” you can select “open houses only”. Homes with open houses will also bump to the top of the search results as well if they match your search criteria.